I’d give a similar response if asked about a favourite walking route in a specific destination. 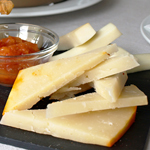 Saying that, there are some routes which remain classic favourites. With the walking season beginning again in the Canary Islands in October, this is the time of year we start to receive emails asking for advice about walking on various islands. In the last few years we’ve walked across the different Canary Islands on a regular basis, either helping design new walking holidays or updating and renovating ones which already exist. There are often surprises, great new routes, and if I was to do this again in another few years this selection might change. But for now, if I had to recommend one circular route on each of the seven main Canary Islands these are the ones I’d choose. It was a toss up between the Anaga Massif and the Teno Massif, but Anaga is really not what people who don’t know Tenerife might imagine. Remote, lush (on one side), rugged, swathed in ancient laurisilva forest, and a feast for the eyes. 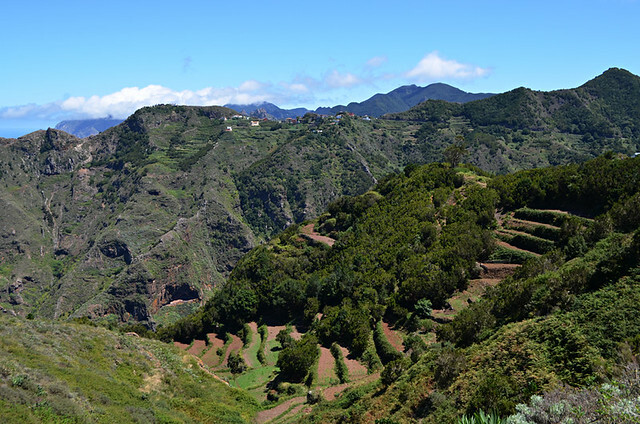 Put simply, Anaga is our favourite area on Tenerife for walking. 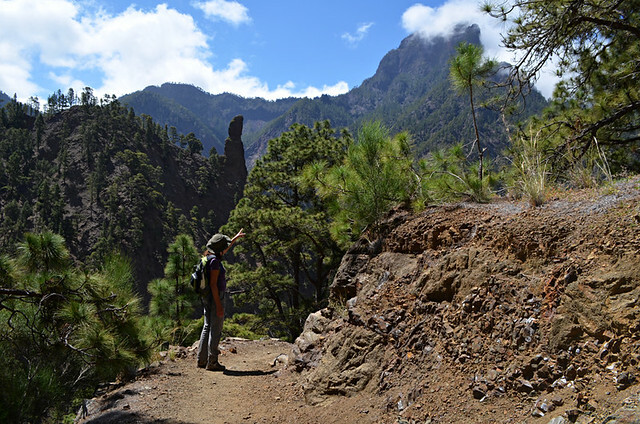 Whenever we want to show friends why we’re passionate about how good walking on Tenerife is we take them on a circular route from Cruz del Carmen to Chinamada, taking in tiny farms, misty laurel forests, goat trail paths, narrow agricultural terraces on the sides of steep hills, and the troglodyte village of Chinamada. It never fails to impress. 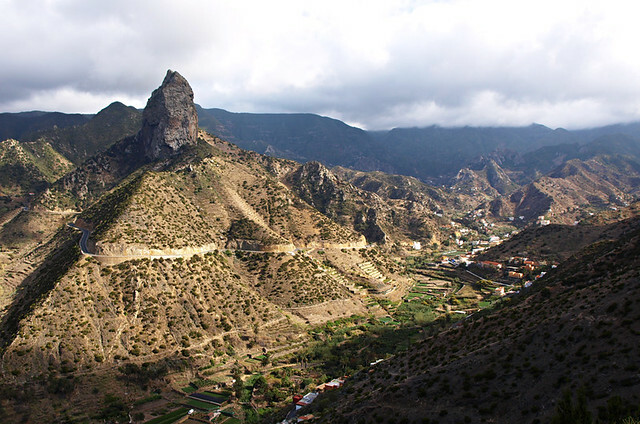 Roque Nublo is a tourist hotspot, but on the circular walking route from Tejeda the chances are the only time you’ll have to put up with others is on the flat plateau which lies at the base of the finger-like rock. Most of the time there’s only sheep for company. It’s a relatively long route which involves a few steep ascents and descents, forest and ridge walking and even crossing a dam. But it’s packed with diversity and the sort of epic panoramic views which make Gran Canaria stand out from other Canary Islands. Plus you get to see another finger rock and you don’t have to share it with the crowds. 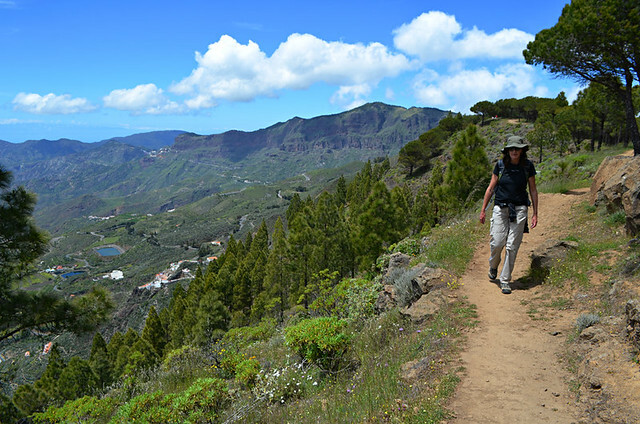 A circuit of La Caldera de Taburiente rewards with one of the most interesting and visually satisfying walking routes in the Canary Islands. Once on the floor of the caldera, the cliffs surrounding it loom above, giving it the air of a hidden world. There is the Canarian rarity of a river in the caldera, the path meanders through the pine forest, there are lots of river crossings on stepping stones and there’s a multi-coloured waterfall. I wouldn’t recommend doing what we tried last time and attempting to walk all the way back to nearby Los Llanos de Aridane, the scramble out on a badly eroded path is a nightmare. The Garajonay National Park might be a UNESCO World Heritage Site but walking routes which spend too much time in the island’s atmospheric forest can get a bit samey. For that reason I’ve opted for a circular route which climbs from Vallehermoso through agricultural terraces and low forest to a ridge at Ermita Santa Clara, usually the haunt of goats and chickens. After that the trail swings to the coast via some quite surreal landscapes and a nervy (if it’s breezy) descent to the Castillo del Mar before a return to the town above subtropical plantations and below Roque Cano. 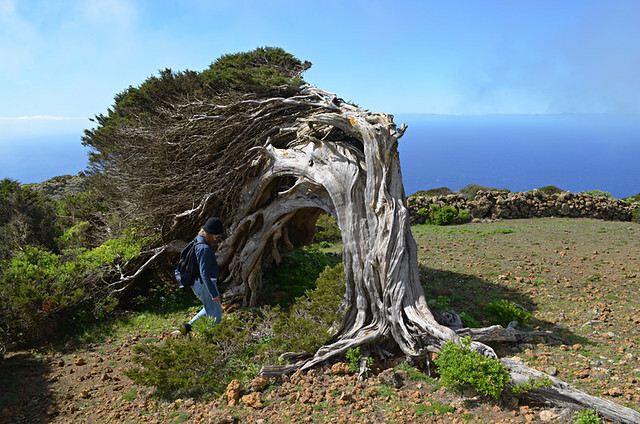 The circular route from Sabinosa to El Hierro’s famous Sabine trees is one of our favourites in the Canary Islands. 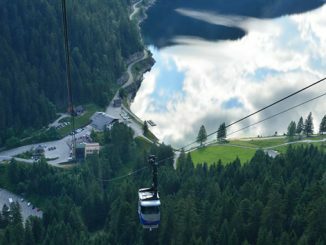 It’s a route which constantly keeps you on your toes as terrain and scenery regularly change. Every time we’ve climbed the huff and puff path to a plateau at the top of the island we’ve levelled out into thick, cool and damp bruma (a type of fog). There’s no denying it adds an atmospheric, horror movie vibe, but it’s always nice when, after a few hundred yards, we enter a different micro-climate and the clouds part to reveal blue skies as well as a countryside that is more Yorkshire than Canarias. The Dales look doesn’t last long before it’s replaced by a magical world of tree avenues and the hypnotically strange and twisted Sabine trees. They might be the highlight of the route, but there are still dizzying views of the El Golfo Valley to look forward to on the return descent. I have to admit to not being a fan of arid landscapes. I can appreciate their beauty… for a short time at least. Basically, I like green. However, Fuerteventura’s curvaceous tangerine hills completely captivate me. 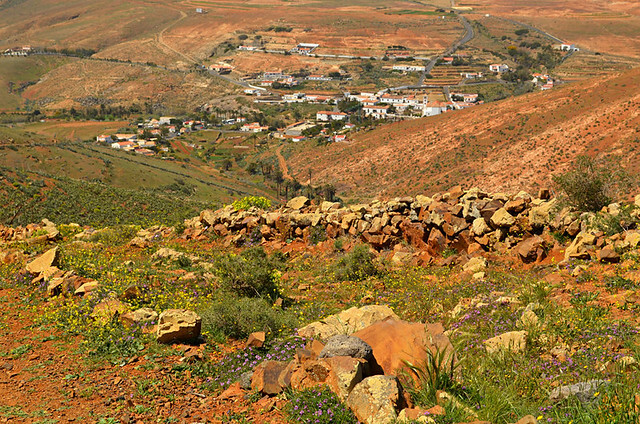 A circular route around historic Betancuria includes much of what makes walking on Fuerteventura quite different from all other islands. In early spring low-lying wild flowers break up the burnt amber hillsides whilst Betancuria itself is like an explosion of white on an orange canvas. The route passes wells, windmills and two giant aboriginal warriors. Timanfaya National Park clearly offers some spectacular volcanic scenery, but when you’re used to walking in Teide National Park as we are you crave different ingredients. Which is why I’d opt for a circular route which illustrates just how ingenious the Lanzarote islanders are. The path passes uniquely Lanzarote volcanic vineyards, corn and aloe vera in coarse black sand fields as well as a the rim of a volcanic crater. 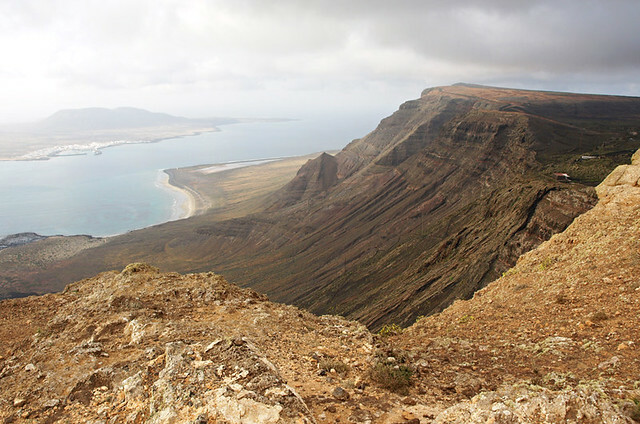 The high point is standing on the Famara Cliffs, which look as though they’ve just melted into the sea, and gazing longingly at the Canary Islands’ desert island, La Graciosa, across the short stretch of water. We regularly tell people that one of the great attractions of the Canary Islands is that each is quite different from any other. It applies to more than just the countryside, but the sheer diversity of terrain you find walking on the islands is partly why we rate hiking on the islands so highly.